Air pollution, primarily from coal-fired power plants, is one of the main impacts that the energy sector has on the environment and human health. These pollutants have many negative impacts, of which those of greatest concern include heart disease, lung cancer, stroke and chronic obstructive pulmonary disease (WHO, 2016). The consequences of such diseases include increased levels of morbidity, which further result in elevated health costs and losses of productivity. 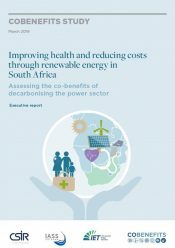 This study quantifies the impacts of South Africa’s power sector on human health, and how a shift to a less carbon-intensive power sector can help to reduce negative impacts and contribute to reducing costs in South Africa’s health system.